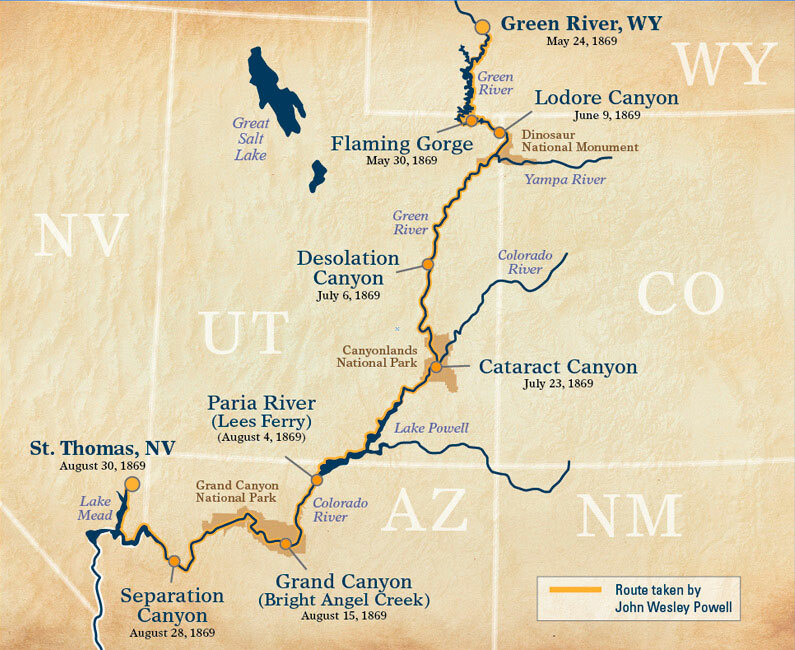 John Wesley Powell’s expedition down the Green and Colorado Rivers in 1869 can easily be anointed the greatest first descent of all time. 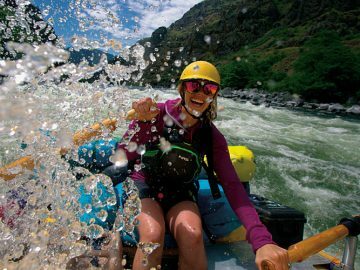 Other river journeys throughout history have covered greater distances, opened better trade routes, and run bigger whitewater. 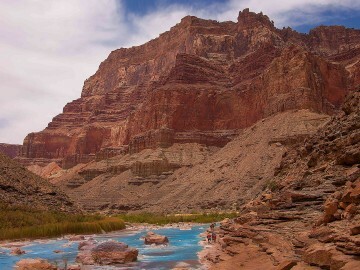 Yet even 149 years later, no other river descent has probed as many virtually unknown canyons as Powell’s mission, culminating with the Grand Canyon—the one that all river trips are measured by, even today. No river journey before or since has entered such an unknown and dramatic landscape, adding important information to the geographic body of knowledge. While most of North America had been explored by 1869—the Rocky Mountains, Pacific Northwest, and far North—the heart of the Colorado Plateau had not. There were no soaring trees or plush beaver pelts to be exploited here, but there was an intimidating and surreal landscape of rocky canyons and isolated tablelands, with limited resources and few native inhabitants. This was the last unexplored region of the United States. 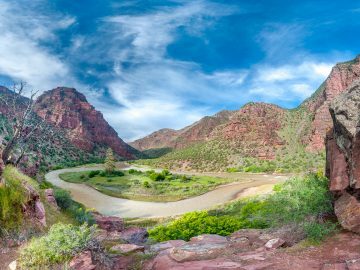 So when Powell, a one-armed Civil War hero, and his nine men left Green River, Wyoming on May 24, 1869, their primary goal was to map an unknown land, using the river as a means of transport. But traversing this obscure region by boat was only practical if they could keep their supplies intact. They carried flour, salt, coffee, beans, bacon—enough rations to last 10 months—and plenty of ammunition. Also weighing their heavy boats were axes, hammers, saws, and augers, everything needed to build a winter cabin if necessary. In the name of science they hauled barometers, chronometers, and sextants. This was an expedition ready for terra incognita, much like the renowned polar journeys of the era. Except instead of penetrating vast regions of ice, this trip traveled through some of our finest future national parks. 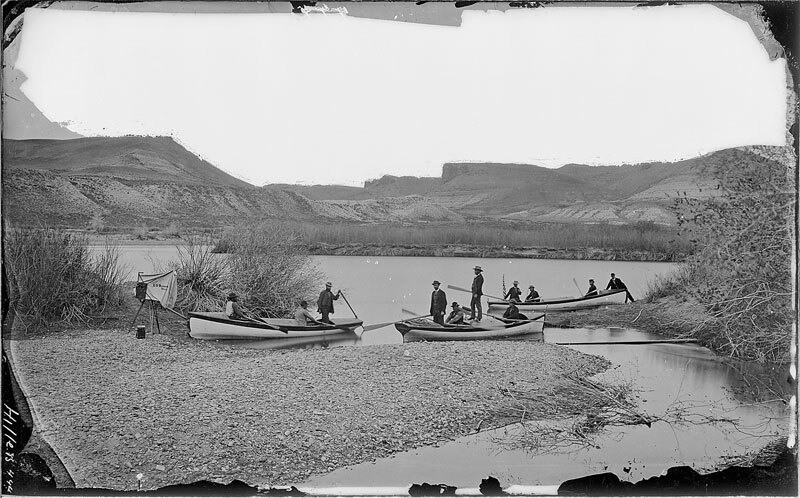 A week into their three-month journey, the crew encounters their first rapids in Flaming Gorge. Things went smoothly enough here, and the men gained some confidence in running mild whitewater. 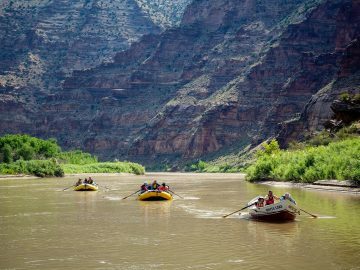 By the 9th of June, that confidence took a hit when one boat, steered by brothers Oramel and Seneca Howland, missed a pull-in above a rapid in Lodore Canyon. The “No Name,” one of just four boats, was broken to pieces. Its life-jacket-less survivors luckily emerged on an island. A week later a fire got loose in camp, and most of the trip kitchen was lost in the melee. 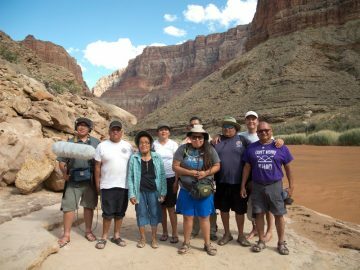 The expedition regained some composure through the canyons of today’s Dinosaur National Monument, and the group emerged into a wide valley below the Uinta Mountains, where there were known crossings. Here Major Powell took a week off from river travel to visit the Uinta Indian Reservation, and make contact with military personnel stationed there. The deepest, most clandestine labyrinth of canyons was just ahead. Frank Goodman, one of the survivors from the No Name wipeout, decided to stay at the agency and make his way back to civilization. They were now nine men in three boats. 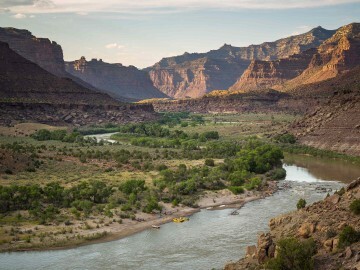 On July 6th they entered Desolation Canyon, and by the 13th they were passing today’s Green River, Utah, forging into the future Canyonlands National Park, where they passed the confluence with the Grand River (it was only called the Colorado below the confluence then), and entered Cataract Canyon. Powell and his team coined the descriptive name, “Cataract,” just as they did for many geographic features along the way. By the end of July they were in a place they would call Glen Canyon, for its many dripping springs. This was perhaps Powell’s favorite haunt of the entire trip. 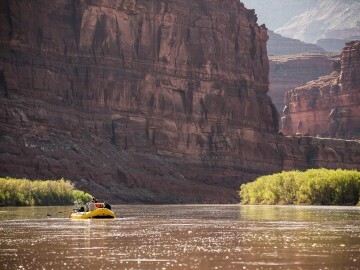 Today, much of the canyon is now lost beneath reservoir waters ironically titled, Lake Powell. When the river runners pushed off from the mouth of the Paria River and the future Lees Ferry, they had been on the water for more than 70 days. “With some feeling of anxiety we enter a new canyon this morning,” Powell understates. Sure enough, they were soon latched onto a cliff above Sockdolager Rapid, looking for a way around. Until this point, most of the Class III or IV rapids on the trip had been portaged or lined, but here that was not an option; “…we must run the rapid or abandon the river…” They ran. It worked. The crew was now forced to row through Class IV whitewater in the greatest gorge on earth—a legendary feat for 1869. The crew stopped at Bright Angel Creek and made new oars from cottonwood trees. They ran and lined more rapids, always wary of un-portageable river-wide falls. They got drenched by an active monsoon season. Their bacon spoiled and rations ran low. 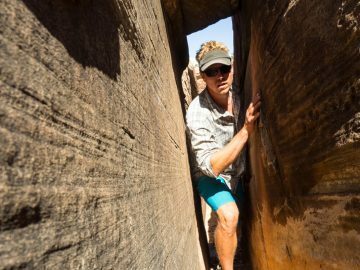 Through it all, Powell managed to take epic side hikes at every opportunity, scouting what gorges might lay ahead and no doubt reveling in his presence within the dreamscape of Grand Canyon. Can you imagine? Unrelenting blind horizons and a threatening food-scarcity produced a group anxiety that plagued the last part of the trip, and when they arrived at another must-run rapid, the Howland brothers balked. 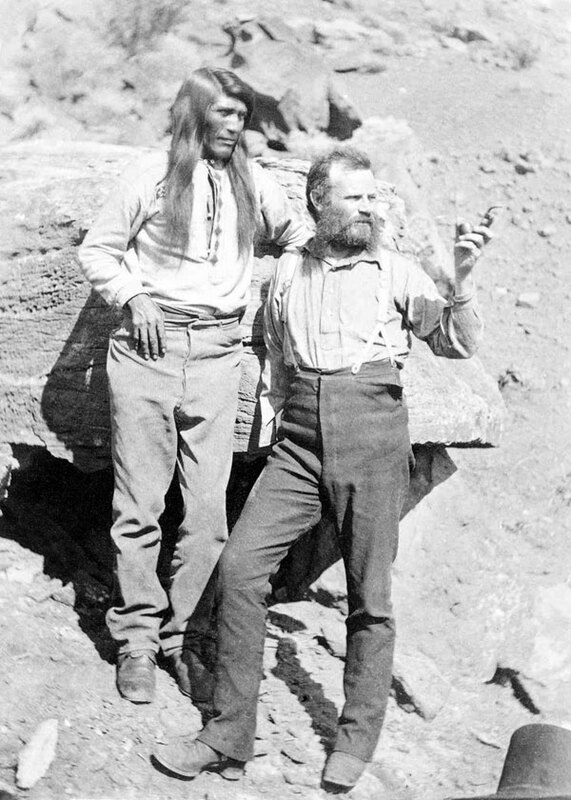 Along with William Dunn, the two hiked out at a place now called Separation Canyon. They were never seen again. Just two days later, the remaining men emerged from the Grand Wash Cliffs. Most of them continued downstream to known outposts to live the remainder of their frontier lives, and a place in history. Powell and his brother reached nearby Mormon settlements, and then traveled on to Salt Lake City. 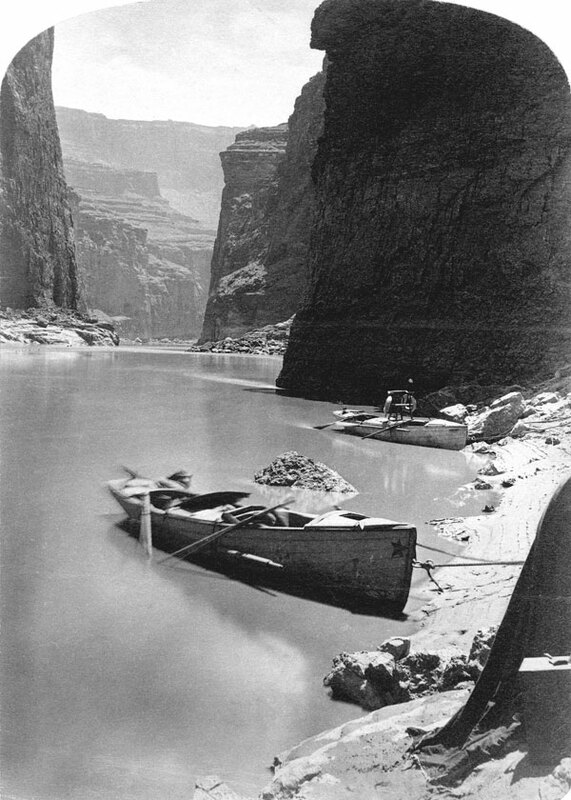 Later, Powell published The Exploration of the Colorado River and Its Canyons , a classic in the annals of adventure literature. He helped create the United States Geological Survey, and became its second director. He pushed for a topographic map system for the country and even helped shape land use policy in the arid West. Powell died in 1902 at the age of 68. And while his legacy is much broader than exploration and river running, one thing cannot be denied: John Wesley Powell led one of the most incredible adventures of all time. All expedition photos are from the 1871 John Wesley Powell Expedition – no photos were taken on the original journey in 1869.